Susan Reh is a Ph.D. candidate in Leadership and Organizational Behavior at the Rotterdam School of Management (RSM) at Erasmus University in cooperation with the Kühne Logistics University (KLU) under the supervision of Prof. Dr. Christian Tröster (KLU), Prof. Dr. Niels Van Quaquebeke (KLU), and Prof. Dr. Steffen R. Giessner. In her research Susan seeks to understand interpersonal processes in organizations and investigates how comparisons among employees, for instance as a consequence of competitive reward systems, influence positive and negative behavior toward coworkers. From 2008 to 2011 Susan completed a Bachelor of Science in Psychology at the University of Hamburg. During her bachelor studies she focused on the intersection of psychology and economy with majors in Industrial and Organizational Psychology as well as Educational Psychology. In 2011 she wrote her bachelor thesis in economic psychology under the supervision of Prof. Dr. Erich H. Witte on the topic “A new version of the ultimatum game: The requisition game”. Subsequently Susan began a Master of Science in Management at Kühne Logistics University in September 2011 which she completed in August 2013. From September 2012 to January 2013 she spent one trimester at the Sino-German School of Management at Tongji University in Shanghai, China. Between April and August 2013 she wrote her master thesis about social comparisons among employees under the supervision of Prof. Dr. Niels Van Quaquebeke and Prof. Dr. Christian Tröster. 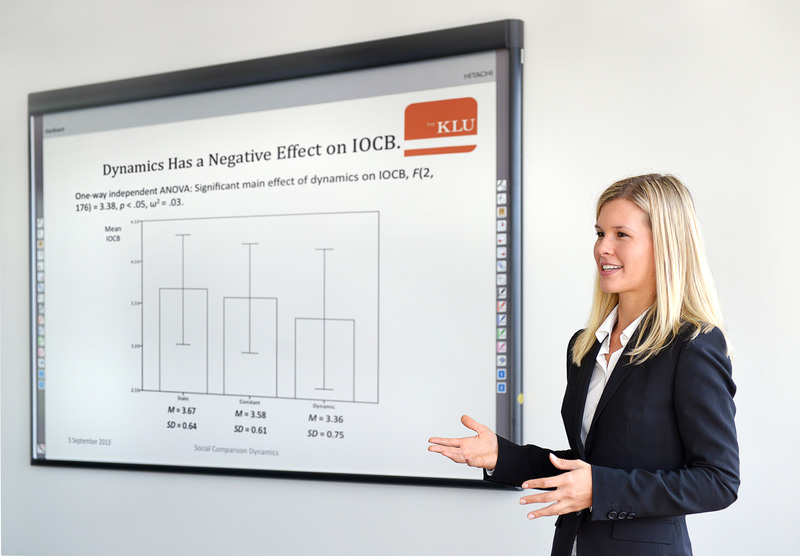 For her thesis with the title “Keeping rivals down: The effect of social comparison dynamics on interpersonal organizational citizenship behavior and social undermining” she received the KLU Master’s Thesis Award 2013. Since September 2013 Susan is pursuing a Ph.D. in Leadership and Organizational Behavior, again with Prof. Dr. Niels Van Quaquebeke and Prof. Dr. Christian Tröster at Kühne Logistics University. In her research she continues to investigate the effects of social comparisons on interpersonal behavior. During her Bachelor’s degree Susan completed an internship at futureformat DGME, a Hamburg-based consultancy focusing on personnel and management development. From October 2010 to August 2012 she worked as a student assistant at the Insitute for Neuroimmunology and Clinical Multiple Sclerosis Research at the University Medical Center Hamburg-Eppendorf. There she worked in several research projects with multiple sclerosis patients. As part of her Master’s degree, Susan completed a another internship in 2012 at Lufthansa Technik in Hamburg. For two months she worked in the marketing department and was involved in different market research projects. From January to July 2013 Susan worked as a student assistant to Prof. Niels Van Quaquebeke at Kühne Logistics University.